The results are in, and just as we kick off the second half of the Premier League season, we're reminded just how valuable the sport has become. The annual Deloitte Football Money League has thrown the murky world of football finance wide open, but there are plenty of questions still to answer. This is the biggest question on everyone's lips. The latest figures show just how much money there is in football, with the top three clubs alone (Real Madrid, Barcelona and Bayern Munich) drawing in a massive £883 million between them over the course of 2012 and 2013. English clubs fared well too, with Man United, Man City, Arsenal and Chelsea all featuring in the top 10 after attracting an impressive £1.1billion in collective revenue. Deciphering where that money comes from isn't easy. Television revenue certainly accounts for a large portion, with last season's Champions League finalists, Bayern Munich and Borussia Dortmund, earning just over £32m between them in UEFA television payments alone. The top clubs also benefited from these competitions, with each team receiving £7 million for reaching the group stage of the Champions League before a ball is even kicked. Then there's the matchday revenue, broadcasting rights and commercial enterprises. Last year's deals with BT Sports and BSkyB saw the broadcasting rights in the Premiership alone top £5.5billion. This is split between the teams depending on how high they finish and how often they appear on live TV. This huge deal was in part responsible for the likes of Man City, Liverpool and Man United all increasing their annual takings by millions of pounds. Sponsorships and merchandising are equally valuable, drawing in huge sums each year for the top teams. In the case of Real Madrid, these commercial ventures totaled £181.3 million, or 41% of their total revenue. 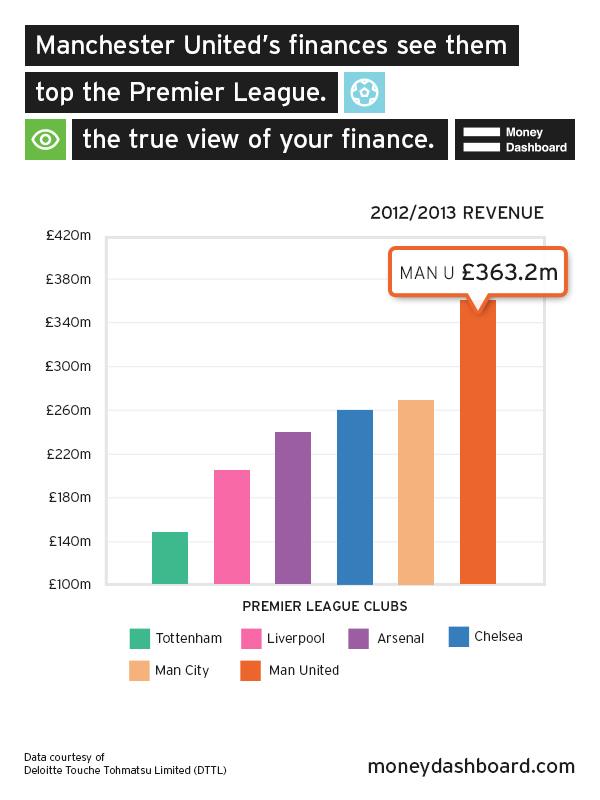 Football is a business, and all businesses need to spend money to make money. The majority of a club's outgoings are subject to confidentiality agreements, but it's safe to say that the vast majority is spent on wages, transfer fees and bonuses. While Real Madrid pulled in £444 million last year, they spent a mammoth £85million (18% of total revenues) securing Gareth Bale from Tottenham in the summer. What's more, the Premier League is one of the biggest offenders when it comes to eye watering wage bills. Man City is reportedly spending more than £200 million on wages each and every year, with some of its biggest earners pulling in at least £150,000 a week. Then there's stadium repairs, charitable ventures, fan services and other expenses, all chipping away at a club's income. While Deloitte's league table shows how much these clubs are turning over, very little is said about the true view of their finances. Taking a team like Manchester United, who surprisingly find themselves out of the top three earners this year, we can see that the figures don't tell the whole story. The club managed to increase its revenue by £43 million last year, taking its total to £363.2 million for the season. This was, however, before current manager David Moyes took the reigns from Alex Ferguson. Since then, the club have been ejected from the FA Cup and League Cup, and are all but guaranteed to lose their Premier League title this year, as they currently languish in 7th place. They may still be pulling in £100 million more than their local rivals, but a fall in prize money is sure to hurt them going forward. Man United's current income is helped by its 35 official partners, with sponsors like AIG and Mamee all on hand to make up for the shortfall. Even more worrying, though, is their profitability. Despite raking in the cash, the club made a loss of more than £300,000 in the third quarter of 2013, adding to a total debt pile of £361 million. Taking this into account, Man United's true view isn't quite as rosy as it seemed. To avoid your finances slipping into the relegation zone, check out the free Money Dashboard service, to see the true view of your financial life.